FAYETTEVILLE, Ark. – Three University of Arkansas intercollegiate athletic programs earned public recognition awards for their exemplary academic performance by the NCAA on Wednesday. 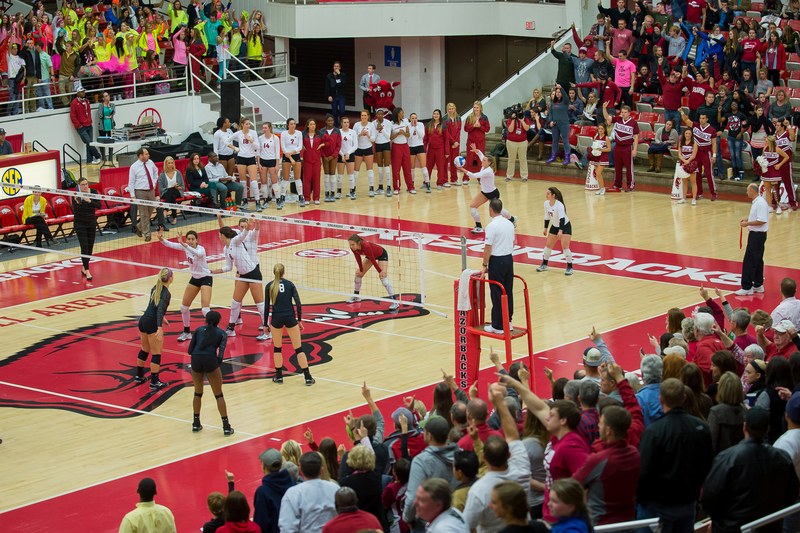 The Razorbacks’ women’s golf, men’s golf and volleyball teams were honored for their standing among the top 10 percent of academic performing teams in the country in their respective sports in the multi-year Academic Progress Rate (APR) for the 2013-14 academic year. All three Razorback programs honored earned a perfect 1,000 multiyear APR rate based on scores from the 2010-11, 2011-12, 2012-13 and 2013-14 academic years. Women’s golf was honored with a public recognition award for the sixth time since the APR public recognition program was initiated. In addition to this year’s selection, the Razorback women’s golf program was previously recognized for the 2004-05, 2005-06, 2006-07, 2007-08 and 2012-13 seasons. Men’s golf and volleyball each earned their third-consecutive honor (2011-12, 2012-13, 2013-14). The University of Arkansas has earned a total of 11 public recognition awards in the past three years. The APR provides a real-time look at a team’s academic success each semester by tracking the academic progress of each student-athlete on scholarship. The APR accounts for eligibility, retention and graduation and provides a measure of each team’s academic performance. The NCAA is announcing multi-year APR scores for all Division I teams, including those earning public recognition awards, on May 27. The University of Arkansas has earned a public recognition award in nine of the 10 years since the program was initiated. In addition to the three sports honored this year, three other programs have been recognized. Gymnastics was recognized in 2009-10, 2010-11 and 2011-12. Men’s tennis was honored in 2010-11 and 2011-12. Swimming and diving was one of five programs, a school record, recognized in 2011-12 joining men’s golf, men’s tennis, gymnastics and volleyball.